Admit it: Before you had your first child in the Washington, DC area, you imagined yourself at the National Gallery or Hirschhorn, staring at an incredible piece of art while wearing your baby in a carrier. But then we had a kid. And then another. And another. And sometimes the days of hitting a “grown up” museum with diaper-wearing kids were relegated to when out-of-towners came to visit. Often those days we spent playing tourist and hitting Smithsonian after Smithsonian became marathons of meltdowns and jailbreaks. Thankfully, we have been doing it wrong. We CAN visit our local, beloved Smithsonian museums with our babies, our toddlers, our preschoolers. We just need to go about the process differently. 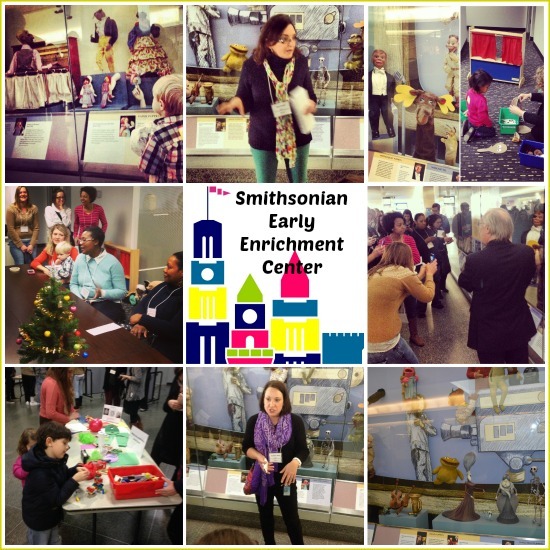 I was honored to attend a blogger workshop hosted by the Smithsonian Early Enrichment Center (SEEC), a non-profit educational entity that provides preschool instruction as well as family workshops within the Smithsonian museums. Dr. Kim Kiehl, Executive Director of SEEC, shared with me and other social media parents in attendance tips for making museum visits with young kids rewarding and fun, and therefore more frequent. With these words, Dr. Kiehl has freed us from the pressure of “making a day out of” our trips downtown. We don’t need to try and see everything! For babies or toddlers, 2o minutes or so is a successful visit. Preschoolers, depending on personality, can maybe do an hour. Break for lunch or a snack, a game of tag on the Mall, and maybe come back for another go. Or maybe not. A short pop-in to the museum, even if your time spent inside is shorter than the Metro ride downtown, is still a fabulous experience for your child. Look online and devise a plan before you arrive. Spend a little time before you visit your designated museum and decide which exhibit or area of the museum you and your child will experience. You can do this alone or with your child if he is old enough. Choose topics or items that will appeal to your child’s interests, or plan to whip through a larger area of the museum looking for one group of items. An example that Dr. Kiehl provides: “Let’s walk through the museum looking for wheels!” No need to read every museum label! Bring things with you from home. The exhibit that SEEC used for its example of how to experience museums with young children was the brand new Puppetry in America artifact wall in the main lobby of the National Museum of American History. This exhibit has two large windows full of puppets, making it about the size of a New York department store display window. If you were taking your young child to see this exhibit, a great way to engage your child would be to bring a puppet of his from home. Although he could not actually touch the first Kermit or Prairie Dawn or Mr. Moose, he could play with his own puppet from home and get that tactile learning in while viewing the puppets. Take pencils, paper and crayons with you. Invite your child to play art student and cop a squat in front of an exhibit and draw what he sees. Or if he is inspired by the works around him, encourage him to make his own art. Engage your child by asking questions about what they see. Keep the queries open-ended, without right or wrong answers. “How are these items alike?” “Which are your favorites?” Keep your kids thinking and get them talking. This is not the time to lecture! Get them to point out items to you. And not just precious pics for Grandma or Facebook posts or Instagrams showcasing your stellar Smithsonian-going parenting (although you know I completely endorse this). Additionally, take pics of the exhibits themselves. Then we you get home , review the photos with your child to help remember and talk about your day. Print them out and let your child turn them into craft projects. Post ’em on the fridge. Reinforce the experience and learning with your child long after the day is over. Incorporate what you learned at the museum in your play at home. Keep on truckin’ and playing with the “lesson plan” you devised with your museum visit. If you checked out the puppets, make paper bag puppets at home. Draw on your hands with markers and make literal hand puppets. If you peeked at Degas paintings and sculptures of dancers, throw on tutus and dance around. So as the cold weather creeps in, are you inspired to visit the Smithsonian museums with your little ones? You can also take your Smithsonian with kid visits to the next awesome level by enrolling in a family workshop! 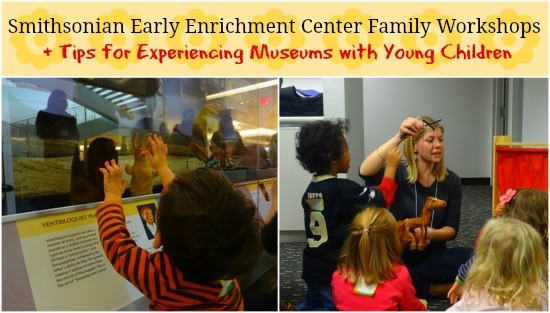 These four week sessions hosted by SEEC are carefully crafted by early childhood educators with extensive museum experience. The developmentally appropriate workshops promote children’s critical thinking, encourage creativity and provide a warm bonding experience between you and your child. Check out the upcoming workshops Smithsonian family workshops and sign up while spaces still remain! Come in from the cold and join us for a “snowy” experience as infants explore some of their favorite winter wonders. Captivating stories coupled with museum visits that will teach your toddler about some of their favorite animals. Explore the masterpieces of the Smithsonian and the “what and how” behind their creation. Filling and dumping, digging in the dirt, stopping to smell a beautiful flower: infants get to work exploring flowers and gardens. Your toddler can easily recognize their favorite foods, but do they really know from where they come? Join us as we explore foods on their journey from nature to table. From portrait to landscape, children discover art through it’s many forms and meanings. Title photos credit: The Smithsonian National Museum of American History via Flickr. Disclosure: I am providing consulting services to SEEC. My blog posts are not connected to my professional duties. All opinions are my own.